The Magnificent Patek Philippe & Co.
Patek, Czapek & Co. was founded in Geneva, Switzerland in 1839 by Antoine Norbert de Patek and Francois Czapek. “They were known for producing high-caliber timepieces in limited quantities,” according to Vintage Wristwatches (Krause Publications) by former Antiques Roadshow appraiser Reyne Haynes (who now goes by the surname Hirsch). Among the first timepieces made by this famous company were those for Russian royalty. In 1845 when Czapek left the business, and the name of the firm changed to Patek & Co. Around the same time, Patek hired watchmaker Jean-Adrien Philippe as technical director after meeting him at a Parisian exposition. Patek Philippe & Co. came about in 1851 when the company was renamed once again. What many fans of modern timepieces may not realize is that Patek Philippe developed the first wristwatches in 1867. At a time when men were still using pocket watches, these were worn by women with the head affixed to a silk ribbon for fastening around the wrist. Before this innovation, most ladies wore watches as pendants. Queen Victoria of England became a client, in fact, when she purchased a pendant watch at the Great Exhibition in London in 1851. Tiffany & Co. in New York began carrying Patek Philippe watches that same year. Always the innovator, Patek Philippe also created watch staples such as keyless stem winding and hand setting, the sweep secondhand, and the free mainspring. “At the 1867 Paris Exhibition, Patek Philippe was exhibiting chronographs, and also watches offering perpetual calendars, repeaters and split-second chronographs,” shared Hirsch. But it wasn’t all about the technical aspects of making great watches. 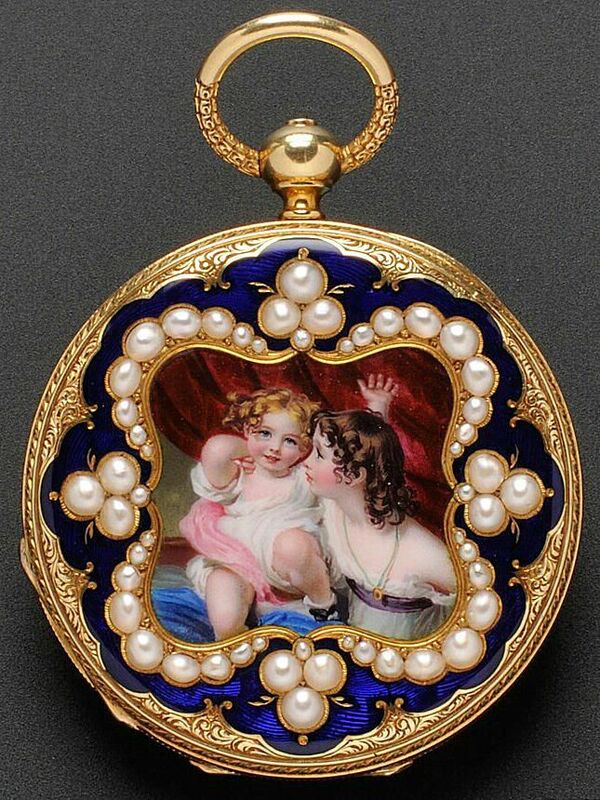 They were known for fine engraving and enamel work on their early timepieces, like the example above, and they are still making very high quality watches today. A great timeline of the company’s history can be found on the Patek Philippe website (patek.com) for those wanting more detailed information. Patek Philippe represents the Rolls Royce of true antique timepieces. Rarely will you find an example offered for sale outside of high end auction houses or the inventory of a very upscale jeweler with estate selections. In other words, if you spot a Patek Philippe at a flea market or thrift store, it’s most certainly going to be fake with the rarest of exceptions. Unlike Rolex counterfeits, which are harder to identify even for professionals, anyone familiar with fine watches will take one look them and immediately question the authenticity. Keep in mind that this is the caliber of watch purchased by consumers with means, and passed down from generation to generation as heirlooms. After all, they were owned by royalty in the mid-1800s and sold in the United States at Tiffany & Co. beginning in 1851, and that relationship continues today. Buying from someone who doesn’t support having a high end watch authenticated, or better yet a business that has already taken that step before putting timepieces like these on the market, isn’t worth the high-dollar risk. Sticking with a dealer or auctioneer who stands behind their merchandise after the sale will help you avoid purchasing a fake. Rolex: Are These Watches Real or Replicas?